WHAT: Concrete delivery (15 - 20 trucks) for installation at the Warehouse Building SOG, including a pump truck. WHEN: Tuesday - Wednesday between the hours of 3:30 a.m. to 2 p.m.
WHAT: Concrete delivery (3 - 5 trucks) for installation at the TPSS #21, including a pump truck. WHEN: Monday between the hours of 7 a.m. to 5 p.m.
WHAT: Two trucks of mortar, one truck of CMU. 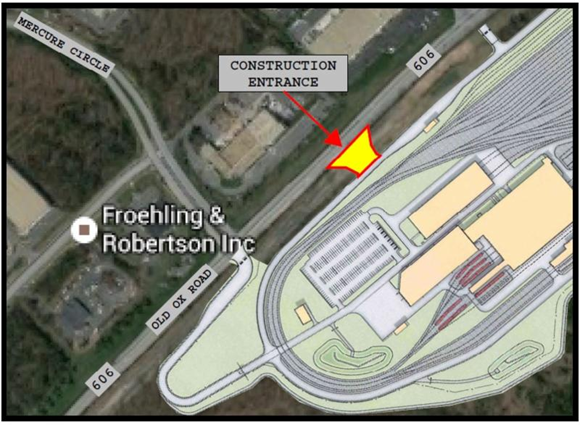 WHEN: Monday (Mortar), Tuesday (CMU) between the hours of 7 a.m. to 5 p.m.
HOW: Trucks will travel from the vendors Fabrication Yard along Rte 606/Old Ox Rd to the project site. WHAT: Crane and equipment (6 - 11 trucks) for Mechanical Equipment.. WHEN: Wednesday and Thursday between the hours of 7 a.m. to 5 p.m.
HOW: Trucks will travel along Rte 606/Old Ox Road to the project site. WHAT: Concrete delivery (2 - 3 trucks) for concrete ductbank activities on site. WHEN: Tuesday, Wednesday, Thursday and Friday between the hours of 7 a.m. to 5 p.m.
HOW: Trucks will travel from the Vulcan batch plant along Rte 606/Old Ox Rd to the project site.